Most cars in the early 1960's were not equipped with even 2 point (lap belt) safety systems. Many of these cars are still on the road today and installing our 3 Point system is the best way to make them as safe as possible. 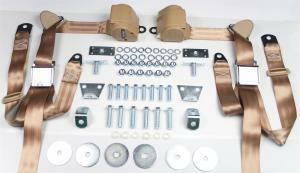 Our 3 Point seatbelt kits feature all chrome, aviation style buckles and hardware. The comprehensive mounting hardware that is included in the Universal kits (from anchors to bolts) are Grade 5 hardness to ensure maximum safety. Our safety belt systems are federally approved and meet or exceed Federal Motor Vehicle Safety Standards. For further ease of installation, Retrobelt offers as standard webbing length: 28" of webbing on the buckle end and 135" of length on the retractor side to aid installation flexibility. Retro Belt USA, We provide a Federally Approved combination of today's safety technology with yesterday's classic car! 67-75 Chevy Camaro/ Pontiac Firebird 2 Passenger 3- Point Seat Belt Kit (WITH ALL NEEDED HARDWARE! )SCROLL DOWN FOR INSTALL MANUAL Retrobelt USA's 67-75 Chevrolet Camaro/Pontiac Firebird 3-Point Retractable Seat Belt System (for 2 passengers) with Detailed Illustrated Installation Guide is one of the best things you can install to help make your Chevy car as safe as possible. This kit comes with detailed instructions on the specific model years of 67-75 Chevrolet Camaro/Pontiac Firebird cars, and comes complete with enough hardware to mount and install front or rear driver & passenger seatbelt systems.